A destination boutique for women who strive for unique, on trend, & upscale apparel, jewelry, shoes, & accessories. 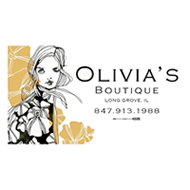 Olivia’s Boutique offers quality, signature products while still providing a variety of price points and sizes. Shop Local! Shop Olivia’s! Step Out in Style! Available after 5:00pm by Appointment!